I really liked that book. I loved both of the main characters: Darla and Alex. They are quite unique and adoreable heros. Alex has a very soft heart and is loyal to his friends. Sometimes his heart seems to be even too soft for this post-apocalyptic world. Darla is very strong and has great technical understanding. I liked that inversion of 'typical roles'. Both seem to be very mature but that's believeable in the cold vulcanic winter. In Ashen Winter we meet some new characters who add up very well to the story. I liked most of the new characters and Ben was just wonderful. The story is told in a very fast manner and actionloaded. Mike Mullin seems to feel obliged to describe especially technical things very detailed. It becomes clear that he wants everything to be consistent and at the end he thanks all those people who advised him about autism, radios/antennas, propane, military trucks, guns. I did not find any objectionable flaws to be exactly. But I think that part was sometimes a bit too overdone. It sometimes felt like a click-and-point action adventure where the characters have to find the nessecary tools and build something they need. 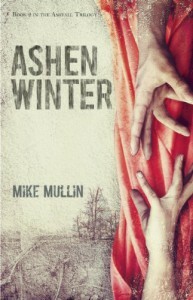 Besides that it was a good young adult story set up in a cold world full of snow and ash. I look forward to read book 3 (Sunrise) in the next days. Fortunately I received a copy of Sunrise from Netgalley.